Marvin Lewis Jones Jr. (born March 12, 1990) is an American football wide receiver for the Detroit Lions of the National Football League (NFL). He was drafted by the Cincinnati Bengals in the fifth round of the 2012 NFL Draft. He played college football at California. Jones attended Etiwanda High School from 2004 to 2008. As a senior, he had 81 receptions for 1,040 yards and 10 touchdowns, leading the Eagles to a share of the Baseline League championship. He is Etiwanda's all-time leading receiver and was a Super Prep magazine All-American. Jones attended the University of California, Berkeley from 2008 to 2011. As a senior, he caught 62 passes for 846 yards and three touchdowns for the 7-6 Bears and he was named Honorable Mention All-Pac-12. In his career, Jones started 38 of 43 games, recording 156 receptions for 2,270 yards and 13 touchdowns. Jones was drafted in the fifth round, 166th overall, by the Cincinnati Bengals in the 2012 NFL Draft. He saw a limited role in the Bengals offense during his rookie season, starting in five of 11 games and catching 18 passes. In his second year, he had a breakout performance in the team's 49-9 win over the New York Jets in Week 8, catching eight passes for 122 yards and a franchise record four touchdowns. He finished the year with 51 receptions for 712 yards and 10 touchdowns, along with 65 rushing yards. His receiving yards and touchdown catches both ranked second on the team. In the Week 8 victory over the New York Jets in the 2013 season, he set a new franchise record of four touchdowns in a single game. In the Bengals 27-10 playoff loss against the San Diego Chargers, Jones set a franchise playoff record with 130 receiving yards on eight catches. Ankle and foot injuries kept Jones out of action for the entire 2014 season. He was due to return to the lineup in Week 5, but he re-injured his ankle in practice the week before and, on October 14, he was placed on Injured Reserve, ending his season. Jones is signed through the 2015 season. After missing all of 2014, Jones returned in 2015 and caught 65 passes for 816 yards and four touchdowns. His first score since returning came in week two in a 24-19 victory over the San Diego Chargers, the last team he had played in a meaningful game against (2013-14 playoffs). Four weeks later, Jones set a season-high mark with nine receptions and 95 yards to go along with a touchdown in the Bengals' 34-21 win over the Buffalo Bills. Jones was held under 40 yards in each of the Bengals' last three games, all without original starting quarterback Andy Dalton. With AJ McCarron under center, Jones recorded four receptions for 32 yards in Cincinnati's 18-16 playoff loss to the Pittsburgh Steelers. On March 11, 2016, the Detroit Lions signed Jones to a five-year, $40 million contract. ↑ "Marvin Jones #82 WR". NFL. Retrieved 5 January 2014. 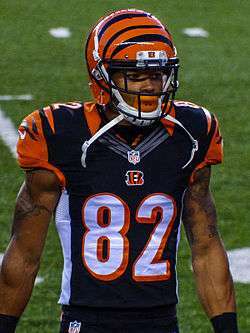 1 2 "Fontana's Marvin Jones is playing for NFL's Cincinnati Bengals". Fontana Herald News. ↑ "NFL Events: Combine Player Profiles - Marvin Jones". nfl.com. ↑ "Marvin Jones - California, WR : 2012 NFL Draft Scout Player Profile". nfldraftscout.com. ↑ Florio, Mike (October 30, 2013). "Marvin Jones is the AFC offensive player of the week". NBCSports.com. Retrieved 2014-06-08. ↑ "NFL - Bengals send Marvin Jones to injured reserve - Rotoworld.com". Rotoworld.com. ↑ Patra, Kevin (March 10, 2016). "Marvin Jones to sign 5-year, $40 million deal with Lions". NFL.com. Retrieved March 10, 2016. ↑ "Marvin Jones Stats". ESPN Internet Ventures. Retrieved 22 January 2014.